In April 1964, The Cumberland Trio recorded 15 songs in one day at RCA Nashville’s famed Studio B, produced by the legendary Chet Atkins. Recording live in studio there were no overdubs or retakes which really surprised and pleased the #1 record producer in Music City. In less than a year of existence the Trio had moved from the unknown “outhouse” to the proverbial “penthouse” of folk music. They won first prize in the National Collegiate Folk Festival in Jacksonville, FL, over 14 other talented collegiate folk acts from all over the nation. A month later they made their national television debut on ABC-TV’s prime time Saturday night series, Hootenanny, receiving a standing ovation following their rousing performance of Ride Up. Over 11 million people watched the show, which also featured the national television debuts of Bill Monroe & the Bluegrass Boys and Doc Watson. The morning after the Nashville session Atkins and RCA offered the students from the University of Tennessee a standard one album contract. He told the Trio and it’s manager Bob Newsome that RCA would send them to New York City to record the same songs at Gotham Studios fearing that if the album were to be released from Nashville it would be viewed as country music. So armed with confidence and an RCA contract, on a Sunday in late May the Trio drove a station wagon from their home base in Knoxville to the Big Apple! None of the boys had ever visited New York. So with instruments in hand the one week journey to the big city began. The Trio came into Gotham Studios having honed their skills even more since recording at RCA, altering some of the arrangements, polishing vocal dynamics and adding 12 string guitar to several songs. They arrived late on a Sunday evening and had to appear at the studio ready to record on Monday morning. Upon arrival at Gotham to their surprise the producer assigned to the project was a 26 year old rock ‘n’ roller, Larry Finnegan, who was aloof, cocky, abrupt and demanding unlike the friendly, father-like Atkins. The engineer was also very condescending and that was a culture shock to the young guys from Tennessee. Nevertheless they managed to record 12 songs over a grueling four day period with countless stops and starts. There were 33 takes on John Henry alone. Unlike the omnidirectional vocal and instrument mics at RCA Nashville, under Finnegan’s direction the Trio utilized individual vocal and instrument mics, sitting on stools for the ballads and standing for the up tempo songs. At the end of each day’s session the Trio and it’s bass player were exhausted. It was a grueling experience but the mission was accomplished, the young men gaining more and more confidence as the sessions progressed. Late on Thursday night the album was finally finished. Relief was the best word to describe their feelings, but they felt confident about the quality of their recordings. Little did they know but a startling twist was about to be presented in the form of an offer from a competing record label. On Friday morning manager Bob Newsome informed the Trio that another record label, Recording Industries Corporation (RIC) headquartered in New York City with offices in Nashville and Los Angeles, had approached him about buying out RCA and offering the group a recording contract at five times the album royalty rate as that of the established industry leader. Newsome subsequently talked with Chet Atkins who knew the executives at RIC and spoke very highly of them, especially the president and CEO, Joe Csida, who had previously served in the same position at industry giant Capitol Records. Atkins told the Trio and manager via telephone that they should seriously consider RIC’s offer since he would have no further involvement in the project once the sessions were finished, mixed and mastered and that RIC would likely promote the album much more than RCA. RIC was a new label having been capitalized with $10 million from a private placement sale to principals and investors. It was an immediate major player in the music business with great fanfare in the industry. RIC had made a huge splash a few weeks earlier by signing the #1 male pop star in the USA, Bobby Darin, as well as the teenage pop/country phenom Brenda Lee. The young men, two of whom were still teenagers, were extremely reluctant to make the switch because of their comfort with Atkins, but the money and hard sell prevailed. RIC bought RCA out of the project including the tape of the Gotham Studios sessions and would officially sign the Trio the following week in Nashville. On Friday afternoon the Trio was photographed at Columbia Records’ photography studios and also met with executives at the two largest talent agencies in the world, William Morris and Ashley-Steiner, auditioning with songs for both. Newsome was told that the group would have to develop a professional act, meaning they would have to learn how to entertain a live audience. The Trio understood the task ahead of them as they were very familiar with the performances of the big time folk groups, including the Kingston Trio, then the highest paid concert act in the music business. They knew what must be done and were prepared to focus on developing a really entertaining show over the coming summer in order to be ready for the album release and touring on college campuses and elsewhere in the fall. After an exhausting five days of recording, interviews and contract negotiations, The Cumberland Trio remained in New York City over the weekend, attending shows at many of the famous Greenwich Village clubs, including the Bitter End, Gerde’s Folk City and the Gaslight Cafe, where they sat at a front row table to see the great Doc Watson perform. Doc had appeared on the same ABC-TV Hootenanny TV show as the Trio in Knoxville and the young men had bonded with him. They also took in some of the city’s most famous sites, including the Empire State Building and the Statue of Liberty. Then it was the drive back to Tennessee where the Trio would meet with RIC officials in Nashville on Tuesday for the contract signing and a press conference on Music Row. It was announced with great fanfare to the entertainment world that The Cumberland Trio had signed with RIC, which would proclaim them “The Kingston Trio from the South”. It was indeed a heady time for this upstart folk group, which one year prior to the announcement did not even exist. It was indeed a trip from the unknown “outhouse” to the proverbial musical “penthouse”. In early June The Cumberland Trio parted ways with manager Bob Newsome and negotiated the rental of the Greystone Playhouse in the resort town of Gatlinburg, TN, the gateway to The Great Smoky Mountains National Park. Ten million visitors came to this resort area each summer but until the Trio there almost unbelievably had been no high level professional entertainment in the area. With guidance from bassist, arranger and equal partner Jim Shuptrine, the Trio converted the playhouse into an entertainment showplace with an extended carpeted stage, stage lights operated from the bass stand and a state of the art sound system. On June 20 the Trio began performing sold out shows Monday through Saturday, two shows each evening. Student friends were hired to run the box office and concessions. It was a family friendly atmosphere with virtually no competition and a rousing success. Shuptrine developed into a first class comedian, new humorous songs and patter were added and the development of the Trio’s act evolved over the summer into an overall performance they felt would be successful on tour that coming fall. On August 28 in Gatlinburg The Cumberland Trio received shocking news. RIC records announced it was taking Chapter 7 bankruptcy purportedly because of The Beatles and the British Invasion of the music and concert scene in the United States. The “Fab Four” from across the pond had hit America shores in early August to begin their first official concert tour. “Beatlemania” swept the nation and almost overnight the musical dominance of the early 1960’s Folk Era came to an abrupt end and with it the hopes and dreams of the Trio. To say that the four young men from Tennessee were devastated is an understatement. After returning to Knoxville from the incredibly successful summer in Gatlinburg, the Trio made a futile attempt to follow the lead of the Beatles and create an electrified pop rock sound. Painfully realizing that is wasn’t their niche, in early 1965 The Cumberland Trio disbanded and began what would become successful careers in banking, law and art publishing. 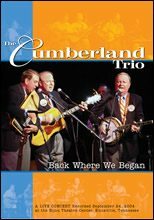 For the next 37 years the members of The Cumberland Trio were in musical “hibernation”. Jerre and Barbara Haskew had written the song “A Lion Named Sam” in late 1963 and it had become a signature concert performance for the Trio. “Sam” had been recorded at their sessions in both Nashville and New York. Barbara had also written the Trio’s signature civil rights anthem “I Wish I Were A Babe” in early 1964. But “Sam” the Lion refused to die. He simply demanded that Barbara help his story live. It took over a year but with the extraordinary help of artist Patricia Mayes of Staten Island, NY, “Sam” sprang to life on the pages of a new children’s book. Barbara presented the proofs to Jerre as a surprise on their 37th wedding anniversary. The excitement surrounding it energized old friendships. “Sam” the Lion began to appear at schools and hospitals and wherever it might bring a smile. It brought The Cumberland Trio back together and spawned the digital remastering and release of The Cumberland Trio (The 1964 RCA Sessions). The release of this CD subsequently prompted demand for sold out reunion concerts at the historic Bijou Theatre Centre in Knoxville, TN in November, 2001 and September, 2004 and the Chattanooga Theatre Center, Chattanooga, TN in July, 2003. Both Knoxville concerts, Reunion Live Concert! and Back Where We Began, were recorded for audio and video by Trio producer Steve Wallace and released on CD and DVD to rave reviews in folk music circles. These recordings included new original songs written by Barbara, “My Rockabye” and “Fiery Gizzard Blues”. In addition the Trio performed at the renowned Riverbend Musical Festival in Chattanooga, TN in June, 2002 and June, 2005. Now in it’s 50th year of existence, the Trio’s music circle is complete with the release of The Cumberland Trio – Lost & Found – The 1964 New York Sessions.